Help girls gain Outdoor skills! Give girls the opportunity to brave the outdoors and gain confidence while learning new skills! 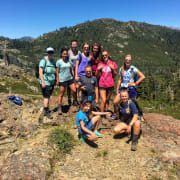 Don’t miss the biggest outdoor event of the year, Girl Scouts Outdoor Adventure Campout, where you can give Girl Scouts the chance to discover their passions for the outdoors, help them put their survival skills to the test, and open girls’ eyes to new adventures, all while they explore nature with their Girl Scout Sisters. Lend your special skills in first aid, outdoor crafts, hiking, archery, fishing, knife skills, survival skills, knot tying, outdoor cooking, orienteering, bird watching, astronomy, yoga/meditation, STEM in the outdoors, sports games, or Leave No Trace. Volunteers can also help with event logistics, set up, clean up and registration. Volunteer shifts are available on Friday, Saturday and Sunday.